The Culligan tech that came to install our new water filtration system was very personable. I’m new to well water and was nervous about not having any knowledge of the maintenance involved with it. He was very patient and answered all my questions. Even explained the entire process, from the well to the point it comes out of the faucet. We also had a reverse osmosis system installed for drinking water and you would never even know we had well water if we didn’t tell you. I quit buying bottled water since having it installed and it tastes better! Very impressed with the price. I’m paying under half of what I was paying for city water. Filter changes and equipment repairs are free. They send a tech out when it’s time, I don’t even have to remember to call, they do that for me. 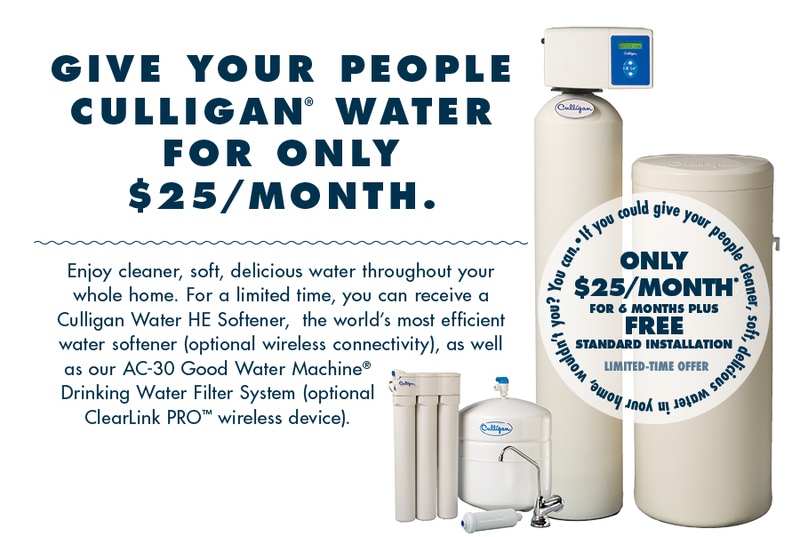 Overall, very good experience with Culligan, from their customer service to the products and services they offer. I would highly recommend them to anyone with well water. They made drinking well water easy. When we have needed help with something, we have always called Culligan first because of their great reputation and for their dependability. I can always count on their prompt service in a pinch! Culligan is a great company!! With reasonable prices!! And excellent customer service!! Great company! They have good, clean tasting water. Professional and friendly delivery and customer service every time i talk to them! We are very happy with our product and service!! Love culligan water ,tastes great .Love not having to go fill jugs any more .Prices are reasonable too.